Beautifully crafted stone encrusted metal Bangles for special occassions. These are available in every size and in bright colors to spice up your ethnic attire! High Gold Quality Plated Bangles of the latest designs could be an effective way to grab attention on any occasion. Beautifully designed wedding and exclusive tomato red bangle set. Sizes Available: 2.4" , 2.6" , 2.8" , 2.10"
We Manufacture this BANGLES on make to order basis choice of metal polish & colour of stones available. 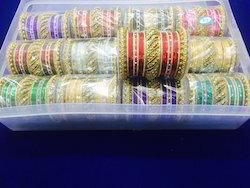 We are manufacturing and exporting Wedding Bangles. Our products are made using qualitative material and are available in different sizes, colour and designs. Our products include Kadas, Bangles, Necklaces, Bracelets, 925 Sterling Silver, Kundan, Gold Plated Jewelry in Contemporary, Traditional Indian, Economy and Designer ranges. We are a unique entity in the industry, actively committed to offering an optimum quality range of Bridal Name Bangles.